Macross Δ (マクロスΔ Makurosu Deruta?, lit. "Macross Delta") is a science fiction anime television series that aired on Tokyo MX in Japan from April 3, 2016 to September 25, 2016. The fourth television series set in the Macross universe, it is directed by Kenji Yasuda (Arata: The Legend, Noein) and written by Toshizo Nemoto (Log Horizon, Tokyo Majin) with Shōji Kawamori being the chief director and mechanical designer, while Chisato Mita handling the original character design. Kawamori is also credited as the original creator along Studio Nue. Macross Delta is set in the year 2067, 8 years after the events of Macross Frontier in a remote part of the Milky Way Galaxy called the Brisingr Globular Cluster (ブリージンガル球状星団 Burījingaru Kyūjō Seidan), which is plagued by the Var Syndrome (ヴァールシンドローム Vāru Shindorōmu), a mysterious phenomenon which turns people berserk without any apparent cause. A team of talented idols, the Walküre, uses the power of their songs to calm down the infected by the Var Syndrome, assisted by the Delta Flight, a team of experienced Valkyrie pilots, while facing the interference from the Aerial Knights of the Windermere Kingdom, which found a way to exploit the infection on their favor as part of their plan to resume war against the New United Government (新統合政府 Shin Tōgō-seifu) for control of the Cluster. 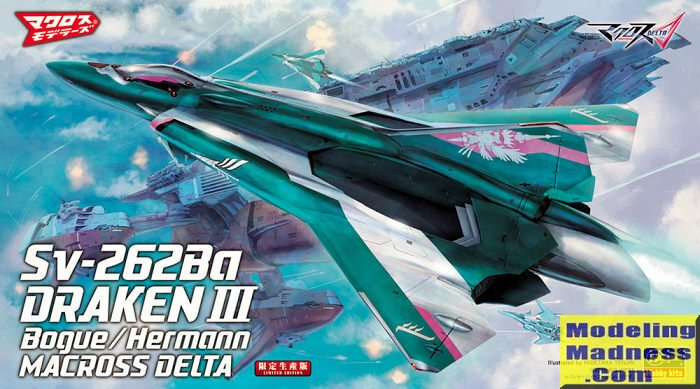 The Sv-262 Draken III (ドラケンIII Doraken Surī) is the Aerial Knights' main Variable Fighter. Its design is inspired by the Saab J.35. The Sv-262Ba is the default variation used by the Aerial Knights. This is based on last year's initial release of the Sv-262Hs. I know absolutely nothing about the Macross Delta series but apparently it is one of many iterations of the Macross universe. I have Bill Wagner, the current IPMS Gateway president to thank for getting interested in Macross. This kit was purchased to help beef up a train shipment from Japan. I am rather surprised at the size of the thing as it comes in Hasegawa's thicker standard boxes. It is also molded in dark green, apparently to help with painting. Like the s-f/fantasy/anime kits that are produced in Japan, this one has an extensive decal sheet that takes care of just about any need to actually paint the kit if you are happy with the color of the plastic. Otherwise, there is some paint mixing in your future if you use the recommended Gunze paints. This shade is a mix of 60% Brig ht Blue, 20% yellow, 10% gloss black, and a touch of gloss white. The end result of this will be an interesting dark green. I'm sure one can find a car paint that will be the same. While on the subject of markings, the decal sheet is quite large and the silver on it is really quite well done. I could not imagine masking to paint those areas. Molding on the kit is superlative. There are a lot of parts, some of them rather small, but then this is not a snap kit. The cockpit section has a nicely done seat and one will actually have to do a bit of surgery to some of the seat parts. This will all fit into the lower fuselage along with the intakes (which are four parts per side) and a couple of exhaust tailpipe constructs. These latter pieces will hold the lone polycaps so that when one installs the tailplanes they can be moved. There is a huge sprue of poly-bits, but you only use a couple of them. The other polycaps fit into the lower fuselage. There are a considerable number of vent/intakes that fit atop the upper rear fuselage. There are two options for these and I've not a clue what they might represent, but they do need to be attached in a specific order and decaled prior to assembly. After this the nose cone assembly is built. No indication of any weight is provided so perhaps it is not needed. Next the various wings, and fins are assembled and decaled. This all tells me that one needs to paint this as one goes along. The kit comes with a pilot figure and you can model this gear up. If you choose the gear down option, those are provided and very nicely detailed as well. For the underside there is what appears to be a huge weapon of some sort. Perhaps a rail gun or a particle cannon. This has its own stabilizing fin, which would be folded for modeling the vehicle on its gear. This fits into that poly-cap you installed in the fuselage and has an interchangeable piece so it can be shown either extended or retracted into the shallow weapon's bay. Of course, you can also do an open or closed canopy. The kit comes with one of Hasegawa's very cool and complex looking articulated display stands. Overall, this is one very cool kit. There are two things that might be a bit of an issue. One is that everything is in Japanese, which leaves one in the dark as to the purpose of some items. The other is a personal one in that I don't know anything at all about this vehicle, not having seen the reference series. 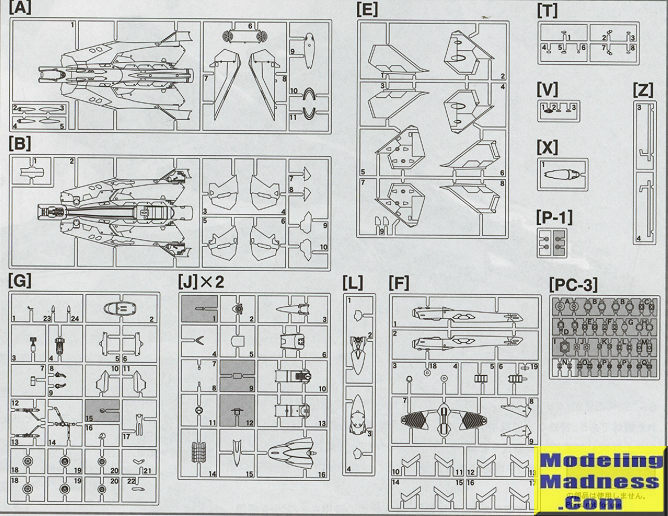 Regardless, it is a kit that I'm sure any modeler with a modicum of experience can build and the end result will be a very neat looking model.